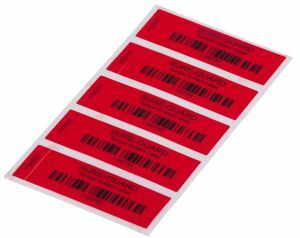 SureGuard Tamper Evident Labels are stocked in red color and feature virtually instant adhesion. Material leaves VOID / OPENED message when removed. Ideal for electronics, envelopes, boxes, or courier packages. Metal or plastic surfaces should be clean and oil-free, swabbing these surfaces with alcohol and allowing to dry provides maximum adhesion and best label performance. Labels feature bar coded number and matching numbered receipt tab, which can be applied to paperwork/work order. Labels are sold per 100 pieces.